What if your last words were immortalized on the frozen screen of a cell phone—but for all the wrong reasons? Such text message memorials have become increasingly common as the number of distracted driving deaths has skyrocketed over the years, making the impact of our cell phones on the amount of auto wrecks statistically undeniable. These statistics come directly from the National Highway Traffic Safety Administration (NHTSA), which also estimated that year that 660,000 drivers were using an electronic device while behind the wheel during the daytime. All told, a full 14% of fatal distracted driving crashes involved a cell phone that was in use at the time of the wreck, according to the NHTSA. 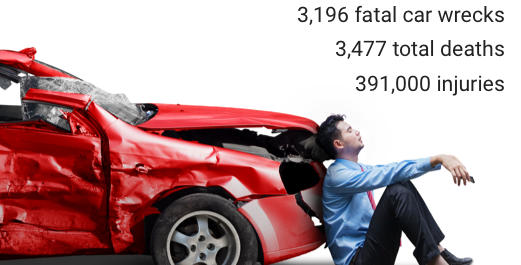 Of the total number of fatal crashes in 2015, 10% involved the use of a phone. The statistics suggest a small uptick from the previous year, when the NHTSA found that 13% of all distraction-affected crashes could be attributed to cell phones—even as the number of 16- to 24-year-olds using a phone while behind the wheel fell more than a full percentage point, dropping from 5.8% in 2014 to 4.6% in 2015. The country also suffered the largest increase of total auto deaths in that same time period, with the number jumping 7.2% between 2014 and 2015, when 35,092 people were killed on American roadways. A survey conducted last year by app company EverQuote also found that we’re even worse at driving than we thought. While a whopping 96% of the study’s 2,300 drivers told the company that the believed they were “responsible” on the roadways, final numbers revealed that the exact same percentage of participants had used a phone while driving within 30 days of taking the survey—all together averaging 0.4 miles of staring at a screen for every 11 miles driven. And while the survey didn’t specify the difference between drivers using a phone to talk or to text—by far the more dangerous activity behind the wheel—a separate spate of questions revealed that most of the drivers felt the need to respond to any text message either “right away” or “within 5 minutes” of receiving it. Despite this, a wide majority of participants—81%, to be exact—reported that they believed they were safer drivers than autonomous vehicles, even though it’s been predicted that the burgeoning technology could reduce all traffic accidents by up to 90%. As numbers have continued to rise, government agencies and other watchdog groups are taking notice—and speaking out about the issue. The NHTSA launched a campaign called “It Can Wait,” urging drivers to resist the itch to text from behind the wheel; the nonprofit Ad Council has set up a website in partnership with the NHTSA to deliver anti-texting-and-driving tips, facts, and videos to younger drivers, who are typically more susceptible to the behavior. But making the road a safer place is the responsibility of everyone on it. Take the pledge not to drive distracted and do your part to end the epidemic.